When the Ford and DiCenzo families first met several years ago, we had no idea we would be coming together to produce Forenzo Wines. Once we made the decision to follow our lifelong dream, we wanted to make sure that we held true to our goal of making this endeavor a true family experience… This desire led us to look within our family history to discover and create the Forenzo brand. As you can see from our logo, we bring to you “Due Famiglie Insieme” (Two Families Together) with the objective of bringing you a true family owned and operated vineyard and to produce enjoyable wines for your drinking pleasure. We found no better way of demonstrating the collective strength that two families have for grape growing and wine making than combining the Ford and DiCenzo family names together to form the Forenzo brand. We believe that together we will bring a passion for grape growing and wine making that will produce stellar wines for years to come. 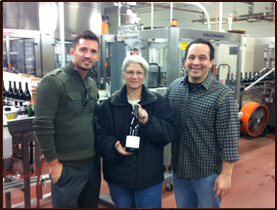 Proprietors Gary DiCenzo and Tony Ford join wine maker Penny Gadd-Coster in showing off one of the first Forenzo Pinot Noir bottles to come off the line in December. 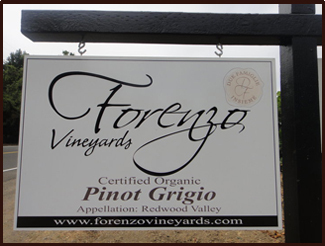 Copyright © 2011 Forenzo Vineyards. All rights reserved.